The ECA Academy is the educational organisation supported by the ECA Foundation (please see www.eca-foundation.org for more detailed information). It develops and organises a wealth of international education courses, conferences (also as part of a GMP Certification Programme) and webinars around GMP and regulatory compliance, picking up emerging GMP challenges and currently discussed subjects. While courses and webinars are designed to provide continuous education for GMP professionals in production, quality control, quality assurance etc, European conferences are organised as discussion forums on new trends and developments. The following video has been taken at one of the GMP Events organised by the ECA Academy. How can I become a speaker for ECA? ECA invites experts who have profound knowledge in the field of GMP to play an active role at our events as a speaker or workshop leader. You are part of a selected team of speakers. 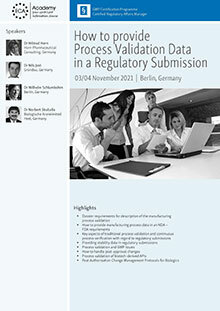 You get to know the opinion makers from authorities (FDA, EMEA, etc.) and industry. Discuss your compliance approach with colleagues from 45 countries! Representatives from industry and authorities are reimbursed for all costs. As a speaker, you are our guest for the full duration of your stay – from the traditional speakers' dinner to the Social Event! Qualify as an ECA Academy speaker. Send us your suggestions for lectures together with your CV to info (at) gmp-compliance (dot) org. What is the difference between education course and conference? GMP Education Courses are designed to provide continuous education for GMP professionals in production, quality control, quality assurance, etc. whereas European Conferences are designed as a discussion forum on new trends and developments. What does ECA have to do with Concept Heidelberg? ECA has entrusted CONCEPT HEIDELBERG with the organization of their events.